The Netherlands barely survived a massive upset and advanced to the semifinals of the FIFA World Cup for the second-straight tournament, defeating Costa Rica 4-3 in a penalty shootout after the match ended scoreless on Saturday. The Netherlands barely survived a massive upset and advanced to the semifinals of the FIFA World Cup for the second-straight tournament, defeating Costa Rica 4-3 in a penalty shootout after the match ended scoreless on Saturday in the teams’ quarter-final matchup. Dutch backup keeper Tim Krul was subbed in for the shootout, and stopped Bryan Ruiz and Michael Umaña’s spot kicks to win the day for the Netherlands. 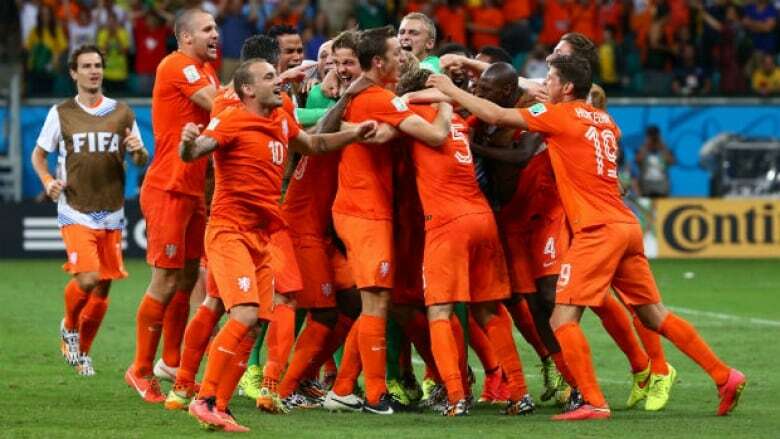 The Dutch scored on all their penalty kicks. The Dutch did everything possible but score in normal time, directing 20 attempts on goal and hitting three posts, as Costa Rica sat back and defended for most of the match, managing only one shot of its own. It was a fascinating move by manager Louis van Gaal to put Krul in for the shootout, but it certainly paid off. Krul did his best to get in the Costa Rican shooters’ heads, trash-talking each player as he stepped to the spot, and ended up making the biggest save of the Dutch squad’s World Cup run when he dove left to stop Umaña, sending the Netherlands through. Keylor Navas. We wouldn’t have even been in the shootout had it not been for another magnificent performance from the Costa Rican keeper, who made seven saves and earned his third clean sheet at the World Cup. This is the first time in World Cup history that the Netherlands has won a match in extra time or the shootout, after five tries. Being late but great. Krul made the shortest debut in World Cup history, coming on mere seconds before full time was blown, but he easily had the biggest impact on the match. The craziest part? He's only 2-for-20 when facing penalties in his last four club seasons, and had never defended a spot kick for his country before this match. "You sit on the edge and think it might go to extra time and penalties and you have to take the team from the quarter-finals to the semis," said Tim Krul. "It's a dream, it's unbelievable." "We have a brilliant, spectacular goalkeeper. What we did on the pitch, what we showed to the world, I think that is crucial. We are not a big power but we demonstrated things, we are leaving very proud," Costa Rica manager Jorge Luis Pinto said. The Dutch likely won’t be happy that they couldn’t finish off Costa Rica before the shootout, but that frustration will be tempered by how they held their nerve in the shootout. But, standing in the way of a return trip to the final for the Netherlands is Argentina and a driven Lionel Messi. Expect the absolute best from both sides in what could be the match of the tournament on Wednesday (CBC TV, cbc.ca/fifaworldcup, 4 p.m. ET). Easily the best performance in the country’s football history. The surprise story of the 2014 FIFA World Cup, Costa Rica topped a group consisting of three former World Cup champions, overcame a former European champion in the Round of 16, and was a hair’s width away from shocking the Dutch. They’ll leave Brazil with their heads held very, very high.